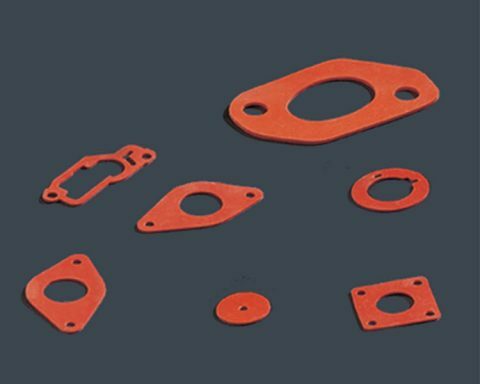 The rubber sheeting and matting range is suitable for most áreas of use, offering the most suitable solution to each rubber scope of application: sealing (gaskets), protection (machine and process), safety (electric insulation, fire/smoke), and flooring (industrial matting). Driking water, several certificates such as ACS, WRAS, BELGAQUA, AS/NZS, etc. Natural rubber sheeting has mechanical properties making it particularly appreciated in environments subject to heavy wear due to friction, or where it is constantly exposed to impact or direct contact with abrasive elements. Available in a wide range of hardnesses from 35º to 90º Sh.A. Low compression set and high resilience. Excellent dynamic and rebound properties. Temperature range: -50º C to +90º C.
Resistance to chemicals; good resistance to acids, alkalis and salts. Its contact with oils and hydrocarbons is not advisable. EPDM sheeting is one of the most versatile types of rubber sheeting and is the most suitable for outdoor applications. It is highly resistant to ageing, even when exposed to the most aggressive external conditions: steam, UV rays, ozone, saltpetre or extreme weather conditions. EPDM sheeting maintains its properties even when subjected to a wide range of temperature differences. As a result, it is consistently used in general industry and in construction, marine and outdoor applications. Excellent inherent high and low temperature ranges. Typically -45º C to +120º C for standard compounds. Special compounding can increase some grades to function continually at +140 º C.
EPDM is inherently resistant to attack by oxygen, U.V., Ozone and extreme weather environments, and will give long service in these conditions. EPDM does not have good adhesion properties. Resistance to Chemicals; resistant to many chemicals and solvents. Good resistance to many corrosive chemicals. The performance of EPDM in hot water and high pressure steam is better than in dry heat. CR or Chloroprene, also known by the trade name Neoprene®, has a balanced combination of properties that make it the best multi-function rubber. Good mechanical and abrasion properties. Reasonable resilience in grades over 60º Shore A. Temperature range: -25º C to +125º C.
Resistance to chemicals; resistant to inorganic chemical products , except oxidising acids and halogens. Moderate resistance to aliphatic hydrocarbons. NBR nitrile rubber sheeting is specially formulated to prevent oil attack, meaning its mechanical properties remain intact even in direct contact with oils and grease. Our range includes nitrile rubber sheeting specifically created to withstand contact with industrial oils, hydrocarbons, kerosene and high temperatures. Our nitrile rubber sheeting is mainly used in the manufacture of seals and other elements for industrial environments, in food grades for the food processing and health industries, and in special applications for transformer oil or dielectric oils for electrical installations and equipment. Good general resistance to oils. Good mechanical properties especially tensile strength, flexibility, compression set and impermeability to gases. Temperature range: -30º C to +120º C, with the possibility of reaching -40ºC. Moderate resistance to low temperature. Resistance to Chemicals; good resistance to inorganic chemical products except antioxidant agents and chlorine, and has satisfactory resistance to general hydrocarbons. Being a polar rubber means it is not recommended for use with polar liquids like ketones, ethers and amines. Limited resistance to aromatic hydrocarbons. With careful compounding Butyl has really good tensile strength. Butyl has very low permeability to air and other gases. Excellent temperature range of -45º C to +130º C for normal compounds and even better with special formulations like cured resin. Butyl has very low resilience which makes it ideal for vibration damping and shock absorption applications. Butyl has moderate resistance to abrasion and compression set. Resistance to chemicals; resistant to most inorganic products. Highly resistant to mineral acids, alkalines and aqueous acids. Not recommended to use in contact with oils, or hydrocarbon solvents. CSM rubber sheeting (also known as chlorosulphonated polyethylene or by the former brand name Hypalon®) is renowned for its excellent resistance to adverse atmospheric conditions and its waterproofing and acid-proofing and alkaline-proofing capacities. CSM rubber sheeting is mainly used in the construction and electrical industries for its impermeability capacities, but it is also frequently used for seals and equipment protection for the chemical and automotive industries. Excellent resistance to oxidation and has outstanding resistance to atmospheric conditions and in particular strong sunlight and ozone. Temperature Range: -35º C to +140º C.
CSM compounds resist fire and are self extinguishing. Silicone rubber sheeting is physiologically inert, thus making it the preferred choice of the medical, pharmaceutical and food processing industries. It also maintains its stability in extreme environments, and its operative properties remain invariable over a wide temperature range, making it useful for a large number of industrial applications in the automotive, electronics and lighting sectors, amongst others. Excellent resistance to heat (dry air), at +200º C continuous and +220º C intermittent. Remains flexible at low temperatures of -70ºC. Resistant to ultra-violet light, ozone and weathering. Silicones have comparatively low mechanical properties, tensile strength, elongation and tear strength, however they keep constant even at high temperatures but should not be used with high pressure steam.Resistance to chemicals; moderate resistance to general chemical products; but acids, alkalis, esters and ketone should be avoided. High elongation Silicone sheeting is specifically designed for industrial lamination processes requiring the use of large-sized protective membranes and high temperature resistance, and it is indispensable in the wooden panel lamination and photovoltaic panel industries. Viton® sheeting, known either as fluoroelastomer or FKM, is highly appreciated for the most demanding industrial applications as it has the highest resistance to hydrocarbons, acids, alkalis and even oxidants, and its mechanical properties remain intact at temperatures of up to 250ºC. Different types of optimised Viton® sheeting exist according to the final use required, and there is a demand for it in heavy industries such as oil and petroleum refineries, steel works and chemical plants, and also in industries with special requirements such as the food industry. FKM’s are serviceable in continuous heat of up to 250º C and intermittent heat of up to 300º C.
Satisfactory resistance to low temperatures of typically -20º C and – 40º C by use of special grades. FKM’s exhibit good flame resistance and are usually self extinguishing upon removal of flame source. All FKM’s have excellent resistance to oxygen, ozone and natural weathering. FKM compounds have outstanding resistance to compression, especially at elevated temperatures. Resistance to chemicals; amongst all synthetic rubbers FKM’s are the most resistant to many of the solvents and chemicals, giving long service where other materials do not. Excellent resistance against hydrocarbons, aliphatics, aromatic and chlorinated chemicals. Good resistance to acids and alkali’s including oxidants. Poor performance against ethers, ketones, and bases. Our wide range of Rubber Flooring encompasses a wide range of products suitable for most uses and it is extraordinarily tough in all applications. It is ideal for public places such as waiting rooms, shops, restaurants, staircases , entrances, airports, port terminals, ships, schools, buses, impact protection and wall protection. Special grades are available for Electrical Applications as per CEI IEC EN 60243-1, resisting from 30,000 to 60,000 test voltage, depending on thickness. CEI 167 Standard. The whole range of flooring can be produced to comply with dielectric standards. Most of our range of flooring can be produced in fire resistant and low smoke emission materials according to different European Standard, up to M2f1 classification (fire resistant, self-extinguishing, with low smoke emission and no toxic smoke). Some of our flooring range is made of special rubber able to resist the oil and fuels in harsh industrial environments.